PC World impressed us recently with its ﬁrst Netbook, the Advent 4211, so expectations were high for its latest offering. 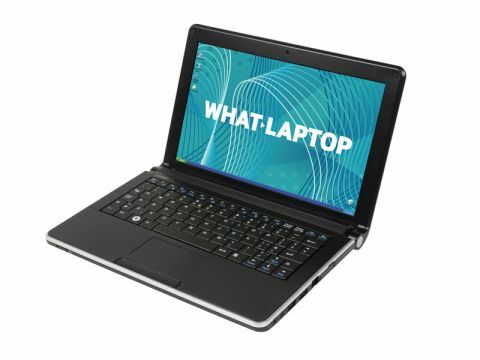 The Advent 4213 (£350 inc. VAT) brings with it a new design and is one of the ﬁrst Netbooks to feature mobile Broadband connectivity as standard. The 1.4kg chassis is slightly heavier than its 1.1kg predecessor, but the new design adds style. The glossy lid is prone to scratches and ﬁngerprints, however. The 205-minute battery life is average for a Netbook and suits the daily commute or use around the home. While the 4211 provided great usability, this model is not as successful. The keyboard has been made smaller, making it difficult to type at speed without striking adjacent keys. The quality of the keyboard itself is fantastic. The 10.2-inch screen appears not to be as bright or sharp as before, but image quality is still strong. The WSVGA resolution lets you work across two windows at once. As with the 4211, the recessed hinge also makes it easy to fold the screen back for use on a cramped train table. A camera is built into the screen panel and lets you add live video feeds to instant messaging software and take quick snapshots. Its blue activity light can be distracting, however, particularly in low light conditions, and we found no easy way to disable it. The specification is common for a Netbook, and provides enough power for email and basic ofﬁce use. The 1.6GHz Intel Atom N270 processor is designed to run smoothly in such a small chassis, but we noticed heat build-up on the underside. The key selling point is the mobile Broadband connectivity. The SIM card is slotted beneath the battery and a T-Mobile contract can be bought with the laptop at the time of purchase. It's not solely tied to this network provider though. is the slowest currently available, but you won't really notice it during use. Microsoft Works is pre-installed and offers a range of ofﬁce tools. However, the spacious hard drive means you can easily install any other software you need and keep working on the move. While it doesn't quite match the quality of its predecessor, this is still a high-quality Netbook. The improved storage and connectivity compensate for its minor ﬂaws, and although you can buy cheaper Netbooks, the Advent 4213 has a lot to recommend it.